A little while ago, David put up a quick update about where we are with our story decisions. There weren’t a whole lot of details in the post, which caused some folks to speculate about what’s going on. David is recovering from the post-convention haze of World Fantasy Con, so I figured I’d fill in some of the gaps. Expect a response in the next week. We hope to email everybody over the next several days — the sooner, the better. I expect that the bulk of emails will go out by Friday, but some decisions may take just a little bit longer. Some folks have been speculating that it’s taking us longer to reply because we’re writing personal responses to everybody. This would be an amazing thing to do! But sadly, that’s not what’s causing the delay. You should expect to get a form response. We are trying to add a little extra detail to some of the form responses, but unfortunately none of them will really be personalized. At this time, we are still making decisions. Some people were speculating that everybody who’s been accepted has already been contacted. This isn’t true. We are still making final decisions and sending out acceptances. This is the part that’s taking a while, so there’s no reason to assume that the response is one way or another until you actually hear from us. What’s taking so long anyway? There are a few things that are contributing to the delay, but mostly it’s because we have so many great stories to pick from. Here’s a little insight into what we’ve been doing for the past few months. 1. First, we’ve read your stories! We laughed, we cried, we were delighted. But there were so many that not all of us were able to read every single one. I’m still catching up on a few stories that Ryan and David have marked as their favorites but which I haven’t read yet. They are both also doing the same. So there is a small amount of second and third reading being done, but luckily the list of contenders is (by this time) pretty manageable. 2. Second, even for the hundreds of stories that all three of us have read, we don’t always agree. In fact, we often disagree. Imagine if you and two of your friends had to take a list of 2,000 movies and agree on which 30 were the best. You’d probably easily agree on broadly which ones you liked… But when it got down to the nitty gritty of the top 1%, your different tastes would come out. So this is what we’re doing right now: arguing about which of the stories we like are the absolute best ones. Just think, at this moment, one of us may be making a passionate argument in favor of your story. This is actually happening! 3. Finally, in addition to picking the best stories, we have to consider variety too. There’s another dimension to our decision-making, which is that we want a broad range of stories in the book — different genres, different viewpoints, different settings. So we find ourselves sometimes diving back into the pile of contenders to pick out stories that have qualities that may be otherwise underrepresented. This balancing act is a pretty complicated calculus, and it’s taking longer than we thought. Whew! So that’s what’s going on with us. One of the things that this experience has taught me is that a rejection from a publication doesn’t always mean that your story isn’t good. A book edited solely by Ryan would be different from a book edited solely by David or a book edited solely by me. Different editors love different kinds of stories — just like different readers love different kinds of stories. Because that’s what we really are: we’re readers. When we publish the table of contents for volume two, it’s not going to be a list of the “best” stories out of the 2,000 submissions we got. It’s going to be a list of about 30 stories that we think make a great book together — a book that we’re going to love reading and we hope other people will love reading too. For many, many, many stories that we don’t accept, there is some other hypothetical book that we decided not to publish that they would be perfect for. So keep that in mind if we decide not to go with your story. Why don’t you publish all those other hypothetical books too? One thing at a time! We’ve talked about whether there’s something else we can do with some of the stories that won’t fit into volume two, but we haven’t made any decisions yet. We have some fun ideas, but first we have to finish what we’re working on now. We also don’t want people to get sick of Machine of Death. That’s why we’re not publishing a book with 200 stories in it. (Also, it would be super expensive.) But if readers keep clamoring for more and more stories, then we certainly have a lot of material we can consider again. But this is all in the distant future of six to twelve months from now, and we may have a whole new set of ideas in that time. We want to keep doing awesome stuff whenever we can, but we don’t know exactly what shape it will take. Anyway, thanks again to everybody who submitted. We’ll be contacting you as quickly as we can with the results! Sounds like you are all up to amazing work, as usual! Thanks for keeping us posted. I hope the three of you get a nice, non-reading-MOD-submissions break for about a month after this is all over. Another quick question: By the phrasing “We are still making final decisions and sending out acceptances”, does this mean that people have already been contacted (apart from the two stories in the handout)? Good luck with all the reading and sorting and emails! You guys are so wonderful for posting as many updates as you do, and for being so encouraging to all the writers who have submitted. Hope you have a happy Halloween! So, a really interesting idea popped into my head: What if you published one story a week? I like this idea, but it could go even bigger. There could be a blog dedicated just to MOD stories. Release one a week or so; you probably have enough high-quality entries to keep it going for over a year. Maybe add some comments from the author of that week’s story. Of course, suggestions for something ELSE to work on is probably the last thing you want to hear right now. Oh, haha. Well even if you aren’t doing personal responses, I still think you guys are doing a tremendous job! This post had a great calming effect on me for some reason. Thanks again for being awesome. Knowing a few that “made it” or “did not make it” would give us something to hunt in the word cloud. Highlighting or crossing off would help prevent the refresh button from wearing out so soon. I’ll post once I know mine… Unless are those contacted sworn to secrecy. Good luck all and share the big pool of patience. The fact that this is killing me just burns with irony . . . Funny – I had a submissions deadline today at work, so all the day, I’ve been frantic. Totally feeling your pain. Unless you’re Julio from COCAINE AND PAINKILLERS. In which case, that Overtime is so good it hurts. Oh sweet Jesus the wait is going to destroy me. But I’ve already gone through about 3-4 months, so I guess I’ll just have to grin and bear another week. If I am reading this right it seems like you are sending out acceptances first, and have sent a few already..that would mean rejections last so the longer we wait, the more likely it is a rejection? It is better to send out acceptances first, hold a few for stories for a waiting list, and then send out rejections. If some of those people who are accepted pull out (it happens), then they’ll go to those that are on the waiting list. I dont want to be negative, but honestly if your stories would be like “awesome” you would have received an email already. By the way, I haven´t gotten one. Relax…read a story from the first book and keep your day job! I don’t know. Even if only 5% of the submissions were really good to excellent, that would leave around 100 stories that they’d have to whittle down to 30 or so. I’m sure there were a handful that really jumped out and were agreed on by all three making the decisions, but I have no reason not to take their word for it that they are still making some crucial decisions. That said, I fully expect rejection. Not that I’m not proud of my submission, but I understand the odds of it really standing out amongst 2000 other stories aren’t so great. I certainly am not losing sleep over all this. Did you even read the post? Being awesome isn’t good enough to get in; I’m holding out hope that mine was original enough to. Thanks for the update! Whichever you send me – my first paycheck or my first rejection letter – I will print out and proudly display on my wall. Either way, I couldn’t be happier that I gave it a shot. i don’t even care anymore. I’m tired of machine of death. You could display a list of shortlists or something if not the final winners; you know, just to prevent people from dying of anxiety and nervousness. The work you’re doing is awesome and I feel honored to be a part of it in any capacity. The whole process has felt so much more in touch than other submission processes I’ve been a part of. Thank you guys for everything. This is kind of like the time I got waitlisted at my top choice college. Well, the communication with these two posts started off good. It’s now become very bad. Every one of us is having serious anxiety, and the one thing we all really need to know is whether any emails have gone out yet. If none have gone out, I think we will all feel much better. Even knowing that some have gone out, and they are only rejections or only acceptances would reduce the anxiety we are all feeling. Don’t get me wrong, I know this is hard, but since we are ALL in the business of communicating, I would hope that the DECIDERS would understand that by missing their stated deadline, they knocked out the major coping mechanic that most of us were using to deal with not knowing (because we knew the answer would come on Oct. 31). Now, we don’t know when/if anything has/is being done with our stories, or if other have had answers… and we don’t even know when we will know. All this is a source of major anxiety, and a bit more info is needed! We’re getting a lot more communication that you would ever get if you submitted a book to a big publishing company! I’m thrilled to get to hear about the process at all. Of course I’m anxious and want to know NOW–I’ve checked my email about a hundred times today alone–but we’ll find out eventually. Take a deep breath! I agree that there has been a lot of good communication up until a few days ago. Now, a simple post saying, “No emails have been sent yet” would calm everyone way down. Don’t you agree? You, yourself, have checked your email 100 times today. You and 1799 others have done the same. I think a short post letting us know about the status of emails (I suspect no one has been told anything yet) would be a miracle for our collective anxiety. Don’t you agree? We have had problems in the past with sending out too many emails at once and Gmail throttling our account, thinking we’re spamming. We want to avoid that this time, for obvious reasons, so we’re porting the data over to a different email system. This means that the bulk of the emails have yet to be sent. Sorry, everyone, we’re trying to do this as efficiently as we can, but it is a lot to manage — when porting data it’s easy for something to go wrong and someone to get the wrong email, and we’d hate for that to happen. If we ever do this again I think we’ll have to set up a more robust system for tracking and responding to submissions. Thanks for the update, sir. Like most other people, I’m just taking this thing in stride. When things come, they come. Oh, is that was those were for? I thought it was a complementary meal delivery for submissions. My bad. I got a pigeon but it had a Hogwarts letter. I think the avian mail system has been making too many cutbacks and there’s been too much confusion lately. You guys have clearly not watched enough Blackadder. I remember waiting for the results of the Bar Exam. They don’t notify you. They post the results, coded by last 4 of your SS, on the front door of the law school. My school had a long staircase in the front, so it felt like you were ascending to an altar. When you finished your quest, either your number was there or it wasn’t. . . .
That was only my career. This is Machine-Of-Freaking-Death! C’mon guys, you’re killing me. Even Martin Luther just hammered the results up on the front door. 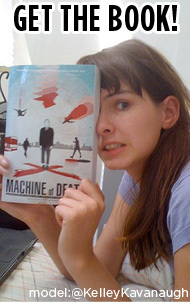 I got my response from the Machine: Death by Boredom, Waiting for Editors to respond. I realise everyone’s anxious, but editing an anthology is not easy. I know editors who never have open submissions for their small press anthologies because they know they would be deluged – instead they invite authors to submit whose work they like. I love the fact that these guys not only opened the floodgates, but are obviously taking a huge amount of time and effort to give every story the consideration it deserves. You never know – the story they are wrangling over might be yours! I can verify this as someone who actually does work for an invite-only small press ( wordplague.com ). If our handful of editors had 2000 submissions to deal with, there would be a lot of drinking and swearing and we would all probably develop meth habits. I admire you for reading 2000 submissions. I only had to read a small fraction of that as a guest editor once and I barely managed without going bonkers. Thank you for the updates on the process. I realize I am a part of the frothing hurricane of anxiety along with so many others awaiting replies, but I still thank you for your efforts, for opening the submissions to everyone and for taking the time and eyeball-straining job of reading all of our stories. It’s nice of you guys to apologize for delays and such, but really, I don’t think anyone really feels that any apology is required. You’ve been as transparent and responsive as I think anyone could expect, and, almost more importantly, have clearly devoted much of your personal time and energy to treating the stories you received with care and respect. Thanks for providing 1800 (?) people with encouragement, an exciting opportunity and a sense of community. You guys are great, as are the people who’ve taken the opportunity to be part of this project. I can’t wait to see the finished product, whether I get to see my name in it or not. I had a dream last night that my story was accepted. Just got my rejection emails through, which is good because rejection of my stories implies a higher standard in the book as a whole. Cognitive dissonance, huzzah! Seriously, while I am still proud of the stories I wrote, they were the first works of fiction I’ve written since school, and I can consider them more as a platform for me to get into writing than serious contenders. Very much looking forward to reading those works that were (or at least that fit) better than mine. I got my email! And… it’s a “no” 😛 But, quite honestly, I can’t find a way to feel bad about it. Firstly because it’s expected – not that I didn’t have faith in what I wrote, but come on, making top 30 out of almost 2000 stories? That’s quite a longshot. And secondly, because I actually loved the e-mail – very thoughtful and even informative (which it didn’t even need to be). And of course, last but not least, because I’m sure that the selection process is expertly aimed at creating the most kickass book possible. And, knowing the first one, I’m sure I’ll love MOD2! That said… in case any of the “MOD guys” are reading this – is it okay to publish my story in my blog? Would that affect the chances of it being used in potential future projects? I guess this question will more likely be answered after the “storm” is over, but here it goes anyway. Got mine as well. I was disappointed but, hey, still looking forward to reading all of the successful ones. Yeah, I am one of the 1928 whose stories didn’t get selected. But so what? There’s 1927 others, so it isn’t that bad, for starters. And you don’t learn to get up unless you fall. There’s always a next time! Congrats to those who get their names up in print. Yeah, I got my expected rejection. Truth be told, I don’t think my story would have been quite the right fit. My story was somewhat predicated on breaking just about every submission guideline the guys listed. Still, it was a lot of fun to write, and I’m thankful for anything that actually inspired me enough to be creative these days. Thanks to whoever ended up reading my story, I hope it amused you at least a little. And thanks to the whole MoD team for promoting so much creativity! I’m a fellow rejectee. Ah well, there’s always volume 3! Many thanks to the Machine of Death trinity for all their tremendous work, mind-melting amounts of reading, and prompt replies! though rejected i’m giving my story to a friend to post on his website. No one i know was accepted, and there were some really great stories about music, love, the apocalypse, and others. It seems like machine of death people did have a tough task, but they likely chose according to thier prospective market (indie kids that whine a lot) instead of good quality stories that are original and less marketable. It’s all just business. If that’s really how they chose the stories then I’m sure they would have accepted my story “INDIE KIDS WHO WHINE A LOT”. You and your friends sure did a lot of work to get into an anthology for which you seem to have so little respect. Why go through so much trouble? I’m with Jack above. Besides, with the sheer odds at hand, it’s practically certain that lots of awesome stories got left out, and that that couldn’t be helped. I understand the frustration – I had hopes for my own story, naively optimistic as that may be – but whining like that seems hardly constructive. Y’know, I really like the supportive, encouraging tone of all these messages and blog posts, but part of me is thinking: surely, in these 1900+ stories, there must have been some utterly abysmal, terrible pieces that tear right over the reasonable, well-written guidelines and would have driven English teachers to their liquor cabinets? The audience for MoD can’t be uniformly creative and grammatical, can it? Of course I can understand that you wouldn’t want to discourage anyone and that it might therefore be difficult to meaningfully discuss the bottom of the barrel, but can we at least get some kind of idea, percentage-wise, of how deep the bottom of the barrel might be? I wondered about that, but I understand it would be hard for them to answer this without (1) discouraging the people who just need more experience and technique, even if just indirectly i.e. by not saying anything about their percentage, and (2) increasing their workload even more by having to customize replies. In fact, one of the good things of receiving a fully thought-out, personal, custom letter, IF they sent those, would be getting a handle of how well you’re doing – but, with nearly 2000 letters to send out, that would take weeks on end at the very least. Oh yes, customized replies for everyone would be ridiculous. By “percentage-wise” I was thinking of overall statistics regarding the submissions as a whole, not directed to anyone in particular. 38% outright pass, just not professional quality. 35% decent but not competitively so. 21% worth a second look or multiple reads. 6% argued and agonized over. So, in responses sent out, are you guys down to that last 6%? We’re down to the last, like, 10 by now. I think everyone’s getting an email by tonight. By the way, congrats to anyone who did get accepted. I mean, I hate you for being better than me. But to be fair, that’s hardly something to brag about. Seriously, congratulations to everyone! Now I just will forever wonder which of those percentages that malki posted my story, Losing Your Head, fit into. I know it wasn’t the top 6%, but I’ll always imagine it was that other 21% that was worth a second read. Bear in mind that even the top 6% can’t all make it into the book – that’s still over a hundred stories. If they could, they probably wouldn’t have to argue and agonize over them! Personally I’m somewhat disappointed, but not particularly surprised, that my story didn’t make it in. However, I take it as an opportunity – I felt rushed when I originally submitted and while I felt my story was okay, it wasn’t nearly as good as the idea I had for it in my head. Now I have a chance to fix it up and prepare it for any hypothetical future MoD anthologies. If I don’t put myself mentally into the 21%, my card will read “analysis by paralysis.” Thanks for the fun rollercoaster ride! I’ve blogged sub #1 if anyone is interested. Oh . . . and . . . whining = asshat and none of the rest of the rejectees will want to play with you. I, personally, would rather have 1800 new friends to hang out with. Hey, here’s another place you can submit your story! I can’t pay you, but I’d love to make this a place where we can read some of the stories that didn’t make it… you know, because it’s going to be another tough wait until the book actually comes out! if you didn’t make it, and you just want people to read it, SUBMIT IT HERE: (rejectedmod2.tumblr.com) I’m kind of lazy, and just want to read! But, one burning question I think we all have . . .
Antartica . . . go or throw? One more comment and I’ll go to bed, I swear. The twitter feed is getting harder to follow. Could we maybe, pretty please, have a blog post where everyone can post links to blogged MOD tales in the comments? Thank goodness it’s Tuesday, the last day of hand-wringing and knuckle-biting can begin! AaaaaghHhhhh!